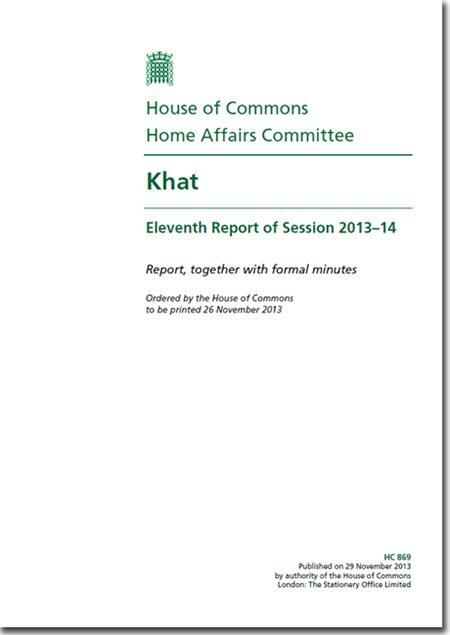 The report 'Khat (HC 869)' calls on the Home Secretary to abandon plans to control khat under the Misuse of Drugs Act 1971 and recommends instead the introduction of a licensing scheme for importers of the plant. The Committee concluded that the Government's decision to control khat was not based on evidence of medical or social harm. The expert Advisory Council on the Misuse of Drugs conducted a thorough review of the evidence and concluded that no social or medical harm resulted from the use of khat; to control it as a Class C drug would therefore be disproportionate. Furthermore, there has been no consultation with members of the Somali, Yemeni and Kenyan communities who use khat in the UK, and also those who produce khat abroad. The potential negative effects, both on the diaspora communities who consume khat in the UK, and on those who cultivate it in Africa outweigh any possible benefits of the ban. The ban on khat has the potential to specifically damage UK-Kenya relations. The Committee is concerned that an important relationship in the combating of terrorism could be significantly and detrimentally affected. The Government has postponed a Commons debate on the legislation to give effect to the ban, pending the Committee's findings. If the Committee's recommendations are accepted then there will be no need to go ahead with the current legislative proposals, though alternative measures for import licences may be required.